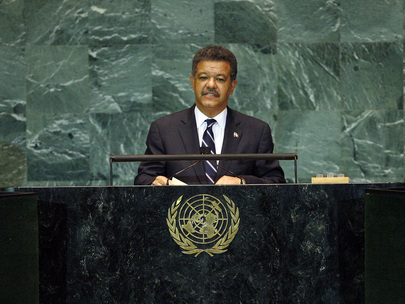 LEONEL FERNÁNDEZ REYNA, President of the Dominican Republic, said that, while taking stock of the Millennium Development Goals last year, and prior to the economic collapse, developing countries were affected by two major crises, one being the sharp rise of oil prices and the other the sharp increase of food prices. The oil crisis provoked vigorous protests in various parts of the world, as all products become more expensive. Governments had been forced to use reserve oil supplies and utilize subsidies in order to maintain peace and democracy. As for the food crisis, he said price fluctuations had pushed an additional 150 million people below the poverty line. Currently more than 1 billion went hungry every day. He also noted that the World Bank estimated that, in order to reach the Millennium Development Goals, $250 billion would be needed for the years between 2008 and 2015. The economic crisis had affected developing countries and impacted the resources needed to cut poverty levels. Yet in spite of that, some maintained the illusion that the aims of the Millennium Goals might be met. However, the reality was that the financial crisis had been so intense that anxiety and panic not experienced in years was being felt worldwide. Moreover, because of the crisis, 400,000 children and tens of thousands women had died. Those deaths could have been avoided. "This is a true catastrophe. It is something morally and politically unacceptable." He then called on the General Assembly to declare a state of emergency in regards to the Millennium Development Goals. Indeed, an entirely different attitude needed to be adopted if those targets were to be met. Although such an approach could be seen as failure, he insisted that not to do so would be cowardly. The worse decision would be leaving behind all those needing human solidarity. He proposed that the Goals be reconsidered and that the 2015 deadline for meeting them be extended. The General Assembly would then create conditions in which Governments and non-governmental organizations would be able to shoulder their tasks in a productive way. He understood that there were insufficient resources for the task at hand, but said, "Where there's a will, there's a way." He also drew the Assembly's attention to the possibility of new funding sources and, in that regard, he urged the creation of a new working group which would carry out thorough research for a recommended plan of action regarding offshore financial havens. He noted that the World Bank had estimated that tax evasion resulted in lost revenue of $250 billion, an amount that would provide external aid to meet the Millennium Development Goals. He said OXFAM had noted that some $50 billion was lost because of offshore banks and tax havens, and that Christian Aid had affirmed that the tax evasion between the years 2000 to 2015 would result in a total of 5 million children's deaths. Abundant resources in the world were unfairly and unequally distributed, he said in conclusion, and a new monetary system, one without secrets or laundering was necessary. He called for the General Assembly to make wide and brave decisions so that the right to a dignified life for all people could be realized.